Late last year, Gamasutra said they'd heard of a game Warren Spector (Deus Ex) was working on with Disney. Said it was a "steampunk" title. Looks like they were right on the money. Warren Spector Getting Mousy With "Epic Mickey"? The website of concept artist Fred Gambino (via Superannuation) has some pieces for a project called "Epic Mickey", described as an "interactive game". Which just so happens to be the same codename from the Gamasutra article. Interesting! Most interesting is the fact the artwork on Gambino's site differs from that described in the original Gamasutra piece, meaning we've got some bonafide corroboration going on here, making the whole thing feel awfully legitimate to us. It's unclear what the status of this project is at the moment, or what the final game will actually play like (though rumours suggest it's a platformer), but we certainly like the direction it's taking, incorporating not just Disney characters, but the theme parks as well. 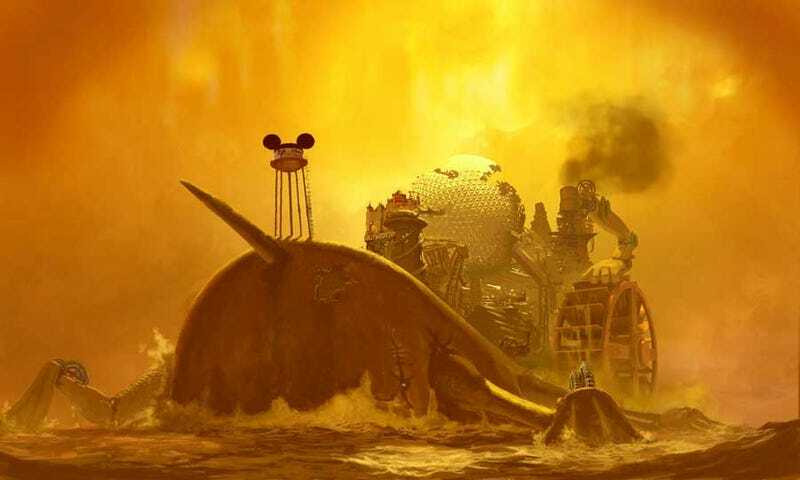 A floating Epcot Center dreadnaught, complete with Monstro hull and Steamboat propulsion, is something we never thought we'd see, but are super-glad we did. UPDATE - cuyahoga over on GAF has done a little more digging, and found the portfolio (always with the artist portfolios!) of Gary Glover, who it seems is also/has worked on the game. Among his pics is this jaw-dropping beach landing scene, which was described in the original Gamasutra article.